Did you know there are apparently two ways to spell loveable? Lovable and loveable. Who knew. 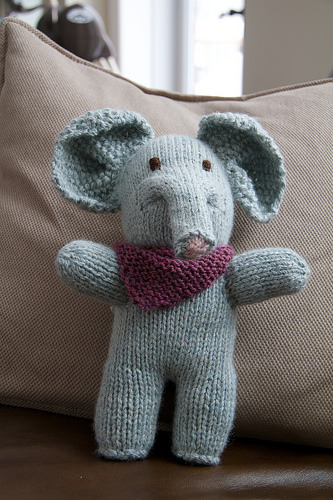 I made this guy once before for my friend Alice’s little boy, her first child. I’ve wanted to make him again ever since, so this time I made him for my baby. The pattern is Lovable Toys from the book Last Minute Knitted Gifts by Joelle Hoverson, and it’s a regular go-to for me in making baby gifts. I used some really nice Brier Run Alpacas yarn from a little place called Oil Springs, Ontario, that my Mom bought for me for my birthday one year at a local tractor show with my Dad. I’ve been saving it for something special and this seemed really appropriate. I had to bump up the needle size because this yearn is heavier in weight than the Blue Sky alpaca yarn that’s recommended in the pattern. This created a few false starts as I realized as I tried to get started that doing the double-strand as called for was too much on 4mm needles. I then tried doing it single stranded but I started to feel like the toy was going to be too small, and the fabric potentially too leaky once stuffed with fibre fill. So last weekend while I was at the cottage I opted to start over on 4.5mm needles double-stranded, which was perfect. But of course I didn’t have all the right tools, so I made it work with the magic loop method (see video below). I was able to make all the toy parts except the trunk, which I finished last night. 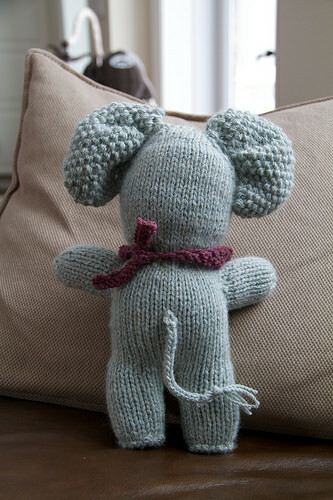 Going with the magic loop method made for some tension issues moving from knitting the legs to knitting the body of the elephant. This pattern is made in a bunch of parts so it’s easy for this to happen. Despite this, I’m happy with how he turned out. One more week of work left and then I hope to enjoy a couple weeks off before our bambino arrives! Can you believe the time has already come?! Whoa.